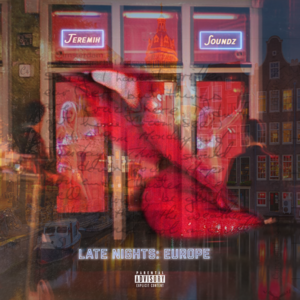 Chicago R&B singer-rapper Jeremih’s surprise mixtape and follow-up to critically acclaimed album Late Nights, Late Nights: Europe has arrived after reportedly having been conceived and recorded in the space of two weeks due to inspiration from Jeremih’s endeavours in Europe on tour. Unfortunately, while this material may have just been recorded recently, it definitely sounds like the left over ideas from his last project were somewhat recycled into Europe, because this does not measure up to his previous work in any shape or form. Beginning with one of the project’s only strengths, the instrumentals and production are actually quite impressive on some of the album’s better tracks, which usually involve Jeremih trying his hand at rapping for a change instead of his usual sensual R&B crooning. The album was produced solely by extremely frequent collaborator Soundz, who adapts his style to the type of track with ease. The album’s best track, “Belgium (Get Down)”, really would not be anything special were it not for that bouncy piano-influenced trap beat – the vocal delivery and lyricism are honestly both extremely lazy. The lyrics in general on this project can tend to get a bit cringe-worthy, whether Jeremih is going much too far on a sexual allusion, or simply overloading songs with lazy punchlines. Most of this album, especially as it draws longer into its middle and latter half, sounds so similar that it all blends together and I found myself just waiting for the end instead of attempting to analyze and listen to the work closely. It just all gets to be too much, as song after song of woozy and overly sexual R&B ballads drone on and on. This was one of the most boring listening experiences I’ve had this year, hands down. What makes it worse is that we as an audience know that Jeremih can do this effectively, even as far as the sexual talk is concerned, as he makes it all work on the songs which become his biggest hits. This is just a case of lack of effort. Of these slower tracks, “Czech Republic” is the most interesting, because it is the only one that comes with a degree of charisma and fun in Jeremih’s vocal performance, instead of mumbling carelessly about subject matter which goes further into descriptive detail than any human being should ever want to hear about, much less listen to repeatedly like one might with a “Don’t Tell Em”. During interviews where the process of creating this work is discussed, it sounds almost like Jeremih and his collaborators are boasting about their ability to create a work and put it out into the world so quickly. The final product, however, is not something to be proud of, and perhaps if they had spent more time it would measure up to his other releases in terms of both critical and public response. I have not seen an overwhelming degree of excitement or buzz behind this album as I have in the past. “The Crib” might be the worst song I’ve heard all year. The entire song is written in two-line couplets, all of which begin “Met a lil’ b****” in various places around Chicago, which one might expect to end in a clever fashion at least once over the song’s four-and-a-half-minute runtime, but none do. And to repeat vocal line so much, one might expect it to be catchy enough that doing so still works effectively, like Fetty Wap’s greatest work, but Jeremih’s disinterested drone, inexplicable use of autotune and lack of melody here makes this the most mind-blowingly terrible song in recent memory. I recognize that sitting down with headphones in order to listen to a mixtape of this calibre is perhaps not the atmosphere to fully grasp the appeal of these songs, but Jeremih and his team could at the very least make these songs more interesting and enjoyable to the everyday listener by adding some diversity in the project’s middle and end to break up the monotony. Being bludgeoned over the head with lazily penned R&B tracks devoted to one subject and one subject only, gets extremely tiring after a while.